Early practitioners of modernist design include the De Stijl (“The Style”) group, founded in the Netherlands in 1917, and the Bauhaus School, founded two years later in Germany. Followers of both groups produced sleek, spare designs—many of which became icons of daily life in the 20th century. The Modernists rejected both natural and historical references and relied primarily on industrial materials such as metal, glass, plywood, and, later, plastics. 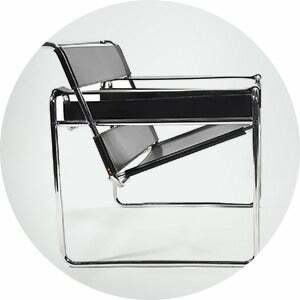 While Bauhaus principles Marcel Breuer and Ludwig Mies van der Rohe created furniture from mass-produced, chrome-plated steel, American visionaries like Charles and Ray Eames worked in materials as novel as molded plywood and fiberglass. Today, Breuer’s Wassily chair, Mies van der Rohe’s Barcelona chair, and the Eames’s Lounge chair are emblems of progressive design and vintage originals are prized cornerstones of collections. It’s difficult to overstate the influence that Modernism continues to wield over designers and architects—and equally difficult to overstate how revolutionary it was when it first appeared a century ago. But because modernist designs are so simple, they can blend in seamlessly with just about any type of décor. Don’t overlook them.